Soap on a rope is a must when you're lacking in shower storage space but you'll appreciate the all natural jute rope even more when you realize how big this bar is. You'll need to wrap the rope onto your wrist just to be sure this big bar doesn't slip your grip. These jumbo bars weigh in at a hefty 6 ounces or more and are all made with natural, organic herbs known to benefit the skin. All of these bars are free of artificial colors or dyes, taking their color directly from the herb used in each bar. Read more about each fragrance and the benefits of the herbs used in each bar below. Patchouli w/Sage Soap On A Rope- A deep, smoky, earthy scent perfect for the man in your life but not so strong that women won't enjoy this sensual scent too. Our patchouli soap is made with organic sage, an herb long known as a natural disinfectant and deodorizer. Sage is touted to assist in the improvement of skin conditions such as acne, eczema, psoriasis, chapped skin and even athlete's foot. It's astringent properties also make it an excellent skin toner. Leather w/Paprika Soap On A Rope- The scent is reminiscent of fresh tanned leather and saddle soap, like walking into the tack room or your favorite leather store. Our leather soap is made with organic paprika, an herb known for it's vitamin content, many of which are crucial to maintaining a healthy complexion. It has been used to treat skin problems such as acne and even spider veins. Paprika is also an effective anti inflammatory and antibacterial herb. Sweet Olive w/Turmeric Soap On A Rope- Sweet Olive, or osmanthus is a sensual fragrance, herbaceous and fresh, slightly fruity and incredibly calming. Our Sweet Olive soap is made with turmeric, an herb long used in skin care in the East. Turmeric is antibacterial and antiseptic, often used to help treat and prevent acne. Turmeric can also help to keep skin supple as well as help treat skin conditions such as eczema and psoriasis. 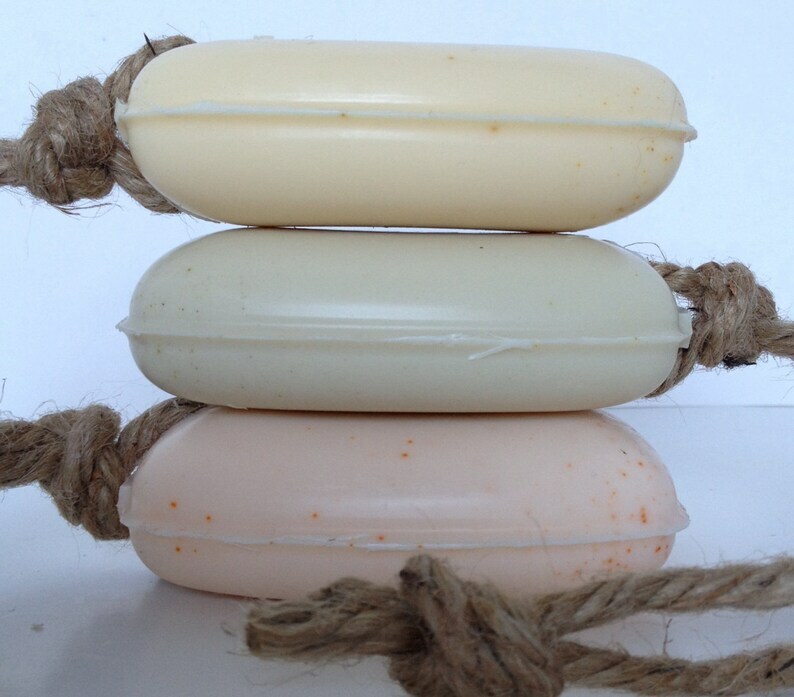 Hanging your soap on a rope in a place that is free of the shower spray will help your bar last longer. Hang in a location where it can drip dry thoroughly between uses to prolong the life of your soap.